Smart Motorways is the use of smart technologies to manage motorway traffic in real-time based on the current conditions. Smart motorways increases the capacity of the motorway without the cost and disruption of adding an additional lane. STREAMS Smart Motorways has a proven track record of delivering safer, smoother and more reliable journeys across motorways in Australia, and has been shown to deliver the equivalent of adding an extra lane of a motorway at a fraction of the cost. STREAMS Smart Motorways has evolved from the integrated STREAMS Intelligent Transport System (ITS) platform, and uses pioneering technologies to monitor motorway conditions in real-time, and has been described by the developers of the ALINEA/HERO ramp metering algorithms from the University of Crete as, ‘The most effective ramp metering system in the world’. For example, when an incident is detected, traffic management centre (TMC) operators simply identify the location and nature of the incident to initiate a response. The system then generates and implements the appropriate response plan automatically. All response plans are generated automatically using approximately 25 basic traffic engineering rules and the system’s embedded Geographic Information System (GIS). Major incident responses such as the closure of a motorway can be implemented in under 10 seconds. Policy changes can be implemented within seconds through a simple change to the relevant rule. If a secondary incident occurs, the additional incident details are provided and the system automatically adjusts the response to cater for the new circumstances. Fast and consistent responses are achieved with a major reduction in TMC workload. Traditional incident response systems typically need more than 20,000 pre-defined response plans. Many more plans are needed if secondary incidents are addressed. These plans are developed manually and are very expense to produce. Policy changes such as a speed limit change often necessitate changes to thousands of plans, and are expensive to maintain. In practice, the pre-defined plans often do not match the particular incident circumstances so typical TMC responses include a mix of pre-defined plans and manually implemented controls. The result is that authorities typically specify that responses should be achieved in under 15 minutes – STREAMS Smart Motorways is achieving this in under ten seconds. Ramp metering seeks to keep the density of traffic on the motorway below the critical level at which flow breaks down and stop-start conditions occur. This is done using on-ramp traffic signals. It can operate using a time-of-day schedule, or adaptively using algorithms to monitor motorway performance and respond based on current conditions. With support from the academic community, Transmax offers the coordinated ramp-metering algorithm suite ALINEA/HERO. Using this, STREAMS balances queues across multiple ramps and maximises motorway performance. The modular architecture of STREAMS means Transmax is able to integrate new algorithms as they become available. The previous ramp metering system on a motorway in Australia achieved four-lane peak flows of 6,400 vehicles per hour. 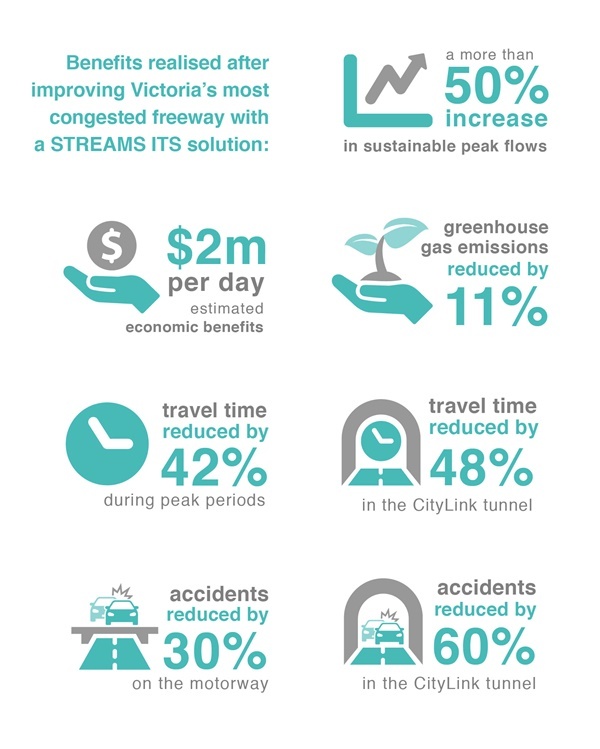 STREAMS is consistently achieving four-lane peak flows in excess of 10,000 vehicles per hour, by preventing flow breakdown. This equates to a 60% improvement. Closure of a motorway on-ramp may be required in the event of a major incident. Motorways managed by STREAMS can modify the operation of the controlled intersection and variable message signs at the start of an on-ramp to close the ramp. This operation is supported by the use of one or more changeable message signs advising motorists of the closure. Lane control is used to dynamically open and close lanes in response to the current traffic conditions. It may be used during incidents to close the affected lane/s or during peak period to create an extra lane using hard-shoulder running. STREAMS Managed Motorways includes a rules engine that assists operators to create a lane closure strategy involving multiple lane control gantries and variable speed limits. The risk of an accident on a motorway increases significantly if a queue is allowed to extend into a high speed section of the motorway. This can be caused by insufficient green time at the intersection at the end of an off-ramp or at the end of the motorway (where the off ramp terminates into an arterial road). STREAMS Smart Motorways detects when this condition is likely to occur and increases the green time to clear the queue. Dynamic speed limits use variable speed limit signs to advise motorists when speeds have been changed from the prescribed limit. An operator can request a speed change in response to a known incident or road conditions. STREAMS can automatically display a supporting message on surrounding variable message signs. STREAMS is able to detect a change in weather conditions through environmental monitoring, and automatically apply an appropriate speed advisory message. This may be supplemented by messages on surrounding variable message signs. STREAMS queue detection provides the ability to automatically detect and monitor traffic queues on motorways. The queue protection algorithm makes speed recommendations using variable speed signs. It recommends changes within and extending past the end of a queue to provide motorists with adequate warning of changed conditions, and back-of-queue protection for motorists unknowingly approaching the end of a queue at an unsafe speed. Integration with CCTV allows operators to view cameras directly from the STREAMS graphical user interface to view real-time traffic conditions. A unique feature of STREAMS Smart Motorways is its rules-based engine to manage speed limits, lane closures, variable message signs, and ramp metering sites in the event of motorway incidents, planned events and inclement weather conditions. Optimising motorway lane usage via the rules-based engine enables the use of less than 25 rules rather than traditional traffic control systems that often use 1000s of individual traffic management plans, significantly reducing a traffic management centre operator's workload. Operators simply identify the location and nature of the incident to initiate a response and then STREAMS generates and implements the appropriate response plan automatically. STREAMS Smart Motorways supports the use of specialised incident detection systems. These systems use video image processing to detect stationary vehicles or pedestrians, in tunnels or on motorways. STREAMS can integrate with these systems to provide comprehensive incident detection and response capability. STREAMS provides tools that allow operators to verify incidents and record incident details in the system. Incidents are classified into six broad categories (accident, breakdown, hazard, flood, roadworks, and planned event). An incident’s classification, together with other details, determines the response plan that will be presented to the operator in the response phase. The STREAMS incident response system recognises that in the majority of cases, responding to incidents that are similar in nature and severity will involve the same sequence of actions. These sequences of actions can be predefined as incident response plans. These plans are templates which are customised by the details of the incident being responded to and may contain manual and automatic actions. STREAMS incident response will suggest messages to the operator for the variable message signs around an incident. The operator may accept, modify or reject the suggested messages. An operator may also request a message to be displayed on a variable message sign independent of the incident response system. Incident information can be published to the internet to provide information to travellers before they begin their trip. Motorists value the provision of travel time information while on the motorway, particularly where travel time to the same destination via a different route is provided. This information allows road users to make informed choices about their route, reduces their travel time, and prevents them contributing to congestion.